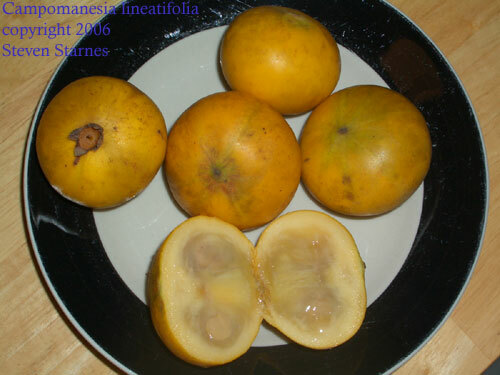 Aegle marmelos- Rutaceae. Common name: Bael fruit. I don't produce this species for sale due to the slow growth rate and disease issues. It does not thrive in our rain forest climate. Seems to prefer a hotter drier climate. My plants were put in the ground in 2003 and have never fruited. Relativeof citrus native to India. Grows best in areas with hot summers. Drought tolerant once established. Shrub to small tree with fruit about the size of a orange. Protect young plants from slugs and snails. Care is similar to citrus. Benefits from applications of iron and magnesium. Used in drinks and medicinally. Drought and heat tolerant. Seeds germinate in 1 to 3 weeks at 85 F (30C). My plants are not setting fruit; likely due to our wet climate. I can NOT provide seeds or plants of this species. Ananas comosus- Family: Bromeliaceae. Common Name: pineapple. Easy to grow in Hawaii. We just plant the tops and do very little to work to grow them. 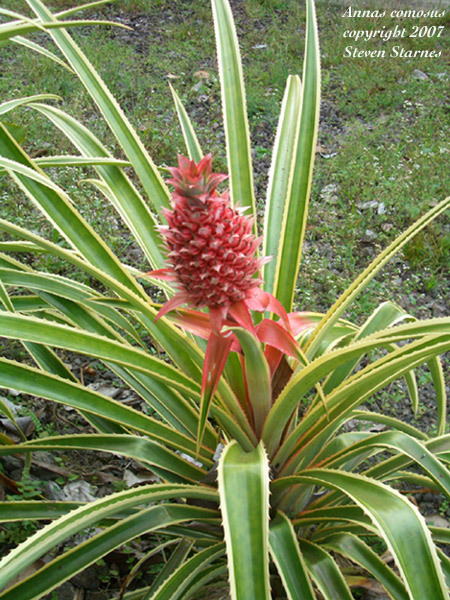 I don't ship pineapple plants; they are very easy to start by cutting the top off of the fruit. Annona muricata- Annonaceae. Common names: guanabana, soursop. Native to lowland tropics in Central America. Very cold sensitive. 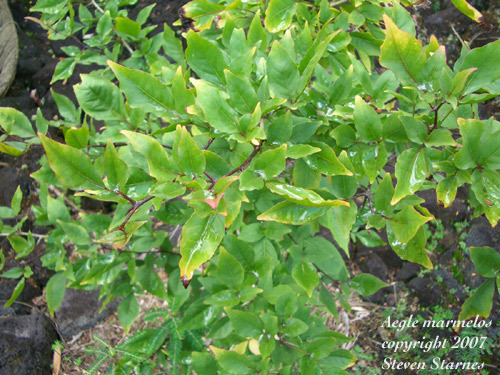 Small to medium tree with glossy leaves. Full sun. Well drained soil with organic matter. Large fruits weight 2 to 3 pounds each. Fragrant white flesh with some fibers. Used for juice in Central and South America. 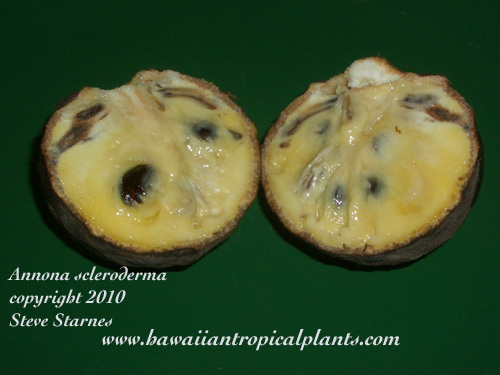 Annona scleroderma- Annonaceae. Common Name: Posh-te. Native to Central America. Delicious fruit about 3.5 inches in diameter. The hard thin shell turns almost black when the fruit is ripe. Flesh is sweet, soft and aromatic and delicious; equal to better cherimoyas. 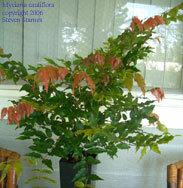 Small to medium tree with glossy 6 to 7 inch long leaves. Trees take 4 or 5 years to bear. This species is native to lower elevations and I don't expect much cold tolerance. 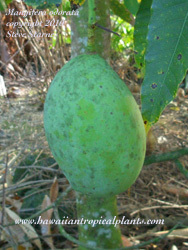 In the Hilo area fruit typically ripens in the late spring through early summer. 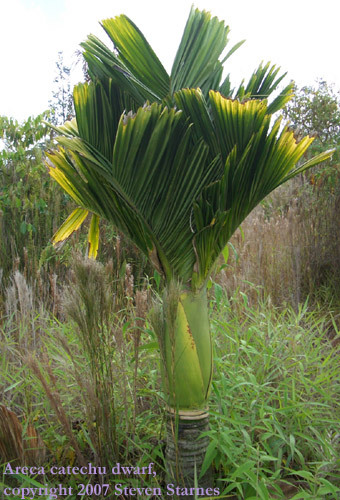 Areca catechu-Arecaceae. Common name: betel nut. Nuts are chewed with the leaves of Piper betel. Has a narcotic effect and stains users teeth red. Popular throughout southeast Asia and the Pacific islands. Plant are fast growing and can reach a maximum height of 100 ft. Dwarf and semi-dwarf forms are available. A dwarf form from Thailand begins to bear fruit when only 4 or 5 ft. tall. Areca macrocalyx- Family: Arecaceae: Common Name: highland betel nut. Used as a substitute for A. catechu. Native to New Guinea. Leaves arch upward. Dark green trunk ringed with white leaf base scars. Reported to grow at a higher elevation. Plants are smaller reaching only about 20 ft. in height. Prefers some shade. Moist rich soil. Fertilize several times per year. Composted chicken manure followed by chelated iron and magnesium works well. I apply a thin layer of mulch 3 or 4 times per year. Plants begin to bloom at about 7 to 8 years old. Artocarpus camansi- Family: Moraceae. Common Name: Breadnut. Large seeds are cooked and eaten. Mature fruits are about 6 inches in diameter. Nice nutty flavor similar to fresh boiled peanuts. Young fruits can be cooked and eaten as well. Large attractively lobed leaves like breadfruit trees. Cultivated in warm lowland tropical rain forest thoughout the pacific Basin. Growth is fast and trees can begin to bear in 4 to 6 years. Artocarpus elasticus- Moraceae. Common name: mendi. Native to Borneo. Rare in the US. Large tree with fruit reported to be of high quality. Large ornamental leaves. Requires tropical conditions. Probably doesn't tolerate prolonged periods of cold. Slow growing when young. However, after the plants become established they have a moderate to fast growth rate. 5 year old plants have reached 15 or 16 ft. tall. At 9 years, the plants are over 30ft. tall. Artocarpus heterophyllus- Moraceae. Common Name: jakfruit. medium to large tropical tree. Deep green leaves. Withstands wind and some drought. Delicious fruits range from 5 to 50 lbs. One of my favorite fruits but a bit messy. I have a dwarf selection that has no latex in the peel and is easy to clean. Fruiting occurs on trunk and main branches. Outdoors in Zones 10 to 11. 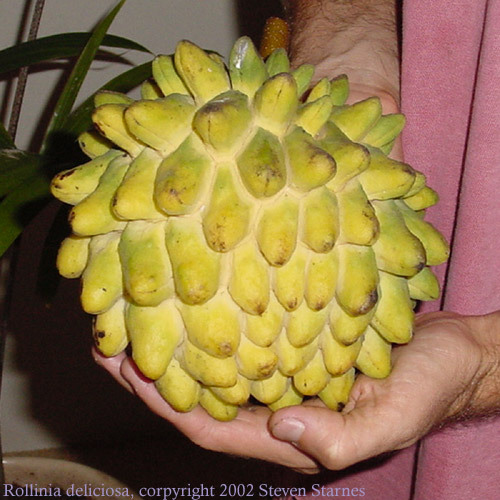 Artocarpus integer- Moraceae. Common name: chempedak. Native to SE Asia. Tropical requirements. Large tree with good quality fruit. 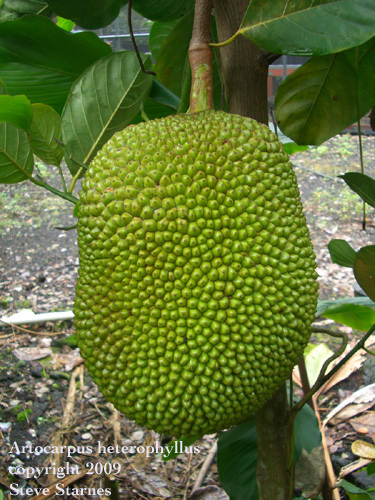 Culture similar to jakfruit. Growth rate is moderate to fast. It seems to take 6 or 7 years to fruit. Leaves are simple and have a rough texture due to moderate number of hairs on the leaf surface. Young stems have stiff hairs on them. 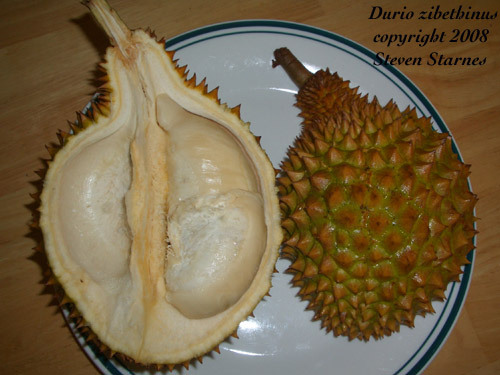 Fruit has a durian like smell. Richly flavored pulp. Remove the peel to get rid of the odor. No latex in the peel when ripe. Artocarpus sericicarpus- Moraceae. Common name: pedalai. Striking large lobed leaves up to 3 or more feet long. Develops a butressed trunk. Fruits are about 6 inches long and ripen to bright yellow. Thin rind with soft projections on the surface. Easy to peel and no latex is exuded. The pulp is white, soft and sweet. Native to equatorial lowland rain forest in Indonesia. Growth is slow for the 1st year but once plants reach about 1 ft. tall, growth becomes rapid. Trees seem to grow well on rocky areas with little soil but fruiting may be delayed. Averrhoa carambola- Oxalidaceae. Common name:Carambola or star fruit. Yellow to orange fruit. Very good flavor. Trees can produce in containers. Medium tree with glossy pinnate leaves. Can be pruned and kept in a container easily. Moderate to fast growing in hot weather. Tolerates light frost for brief periods. Easy to grow. Baccaurea dulcis- Euphorbiaceae. Common Names: Kampuduang, cupak. Medium to large tree native to Sumatra and Java. Grows in lowland rain forest. Seedlings are a bit delicate. But once they are about a foot tall growth becomes faster and plants are more robust. Likes moist rich soil high in organic matter. Growth is much slower on poor rocky soil. Organic fertlizers work well. Supplement with iron and magnesium to maintain deep green foliage and rapid growth. Full sun. Warm temperatures. I doubt that this species will tolerate prolonged temperatures below about 50F. Outdoors in USDA Zone 10B and 11. Baccaurea motleyana- Euphorbiaceae. Common name: Rambai. Native to Malaysia. Dioecious tree requires tropical conditions. Glossy deep green leaves. I tried to grow this one but lost the seedlings after repotting. Probably best to start seeds in individual pots or wait until they are about 10 inches tall before repotting. Baccaurea ramiflora- (Syn. Bacaurrea sapida). Euphorbiaceae. Common name: Burmese grape. Native north eastern India and Burma. Edible fruit. Large dark green glossy leaves. Members of this genus are dioecious and several plants will be needed to assure that you will get both male and female plants. Medium tree. Full sun. Growth rate is moderate. Very young plants had high losses when repotted. Larger plants had no problem with root disturbance. Probably has very little cold tolerance. Prefers a rich slightly acid soil. Be sure to use a fertilzer with chelated iron. Baccaurea sapida- See Bacaurrea ramiflora above. The species name changed. Batocarpus sp.- Family:Moraceae. Fruit is soft and sweet with a thin skin. Edible seeds are about the size of a peanut. Native to lowland rain forest of Ecuador. Related to jakfruit and pedalai. Growth is slow the 1st few months but becomes faster once established. Bixa orellana dwarf- Bixaceae. Common name: dwarf anatto, dwarf lipstick plant. We have a dwarf selection that begins to flower at about 16 to 18 inches tall. Flowers are pink and about 1.5 inches in diameter. The clusters of red pods are very ornamental. Blooms about 3 times each year. With the flowers and pods, this plant provides color most of the year. Cordate light to medium green leaves. Full sun. Well drained potting soil. The seeds yield a red or red-orange dye used as a food coloring and in some cosmetics. The seeds can be ground and used as a spice. 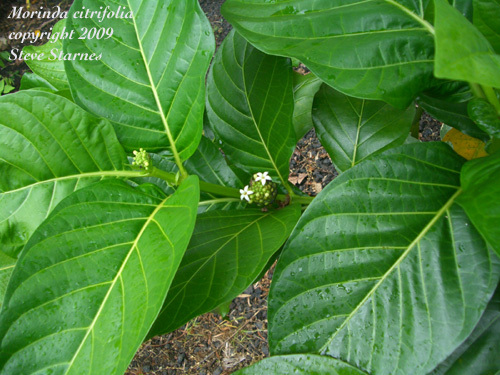 Borojoa patinoi- Rubiaceae. Common name: borojo. Native to Colombia cultivated in other areas of Northern South America. Edible fruits are used as a cure-all and aphrodisiac in Colombia. Large shrub to tree with large ornamental leaves. Prefers rich well drained soil. Begins to bloom at about 4.5 to 5 ft. tall. Not frost hardy. When I grew these in greenhouse in California, seedlings suffered if the greenhouse was below 50F for more than 2 months. Dioecious so male and female plants are needed for fruit production. Male flowers are in ball-like clusters. Female flowers are born singly. Fruit is approximately 2.5 to 3.5 inches in diameter. Bouea macrophylla- Family: Anacardiaceae. Common Name: Maprang. Small tree related to mango. Native to tropical rainforest of South East Asia. Fruits are reported to resemble small mangos but with a tender edible skin. New growth is deep purplish-red. Growth is somewhat slow when young. But trees are supposed to begin fruiting at a small size; 5 or 6 ft. tall. Slightly acid soil high in organic matter. Young plants prefer a protected area with light shade. Fertilize several times per year. Keep moist. I don't expect any cold or cool tolerance for this plant. My plants bloomed but have failed to set fruit. Cool cloudy weather have caused a number of production problems in 2009 and plants have not bloomed at all in 2010 and 2011. Brosimum alicastrum- Family: Moraceae. Common Name: Mayan Breadnut. Large tree native to southern Mexico and Central America. Bears nuts about the size of a filbert. Reported to have a thin layer of edible flesh around the nut. Eaten roasted or boiled. Can be ground into flour for baking. Moderate to fast growth rates. Full sun to light shade. Tropical conditions. Slightly acidic soil. Benefits from light mulch or fertilizer several times per year. Zone 11. 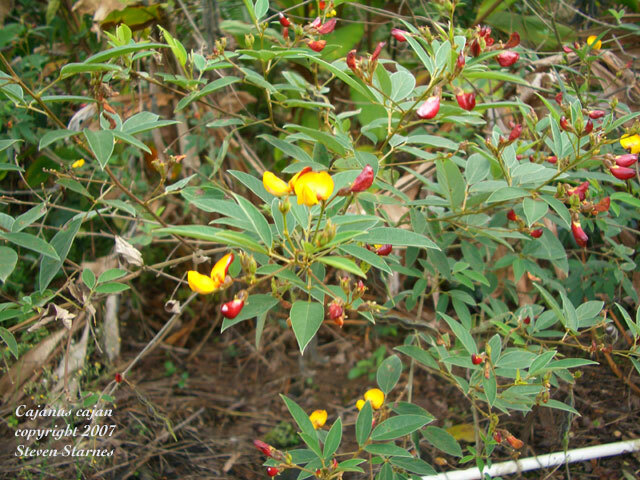 Cajanus cajan- Fabaceae. Common names: pidgeon pea, toor dal. Commonly grown in India but rarely culitivated in the USA. Seeds are used in sambar and other curries. The plants grow well even in poor soil. It is used for soil improvement and green manure. Large shrub with yellow flowers. In frost free areas it is a short lived perrenial. Best to start indoors in pots and plant out after soil warms in late spring. Reported to require a long growing season; most of our plants bloom when 8 to 10 months old. Campomanesia lineatifolia- Family: Myrtaceae. Common Name: Perfume guava. Related to guava. 2 inch fruits ripen to bright yellow. Soft sweet nicely scented pulp. Small to medium tree native to tropical rainforest of Ecuador. Full sun to light shade. Slightly acid soil. Fertilize and mulch lightly several times per year. Clausena excavata-Family: Rutaceae. Common Name: Pink Wampi. Small tree bearing small sweet tart fruit. Native to SE Asia. grows well in tropical areas. Full sun. Rich well drained soil. Use a citrus fertilizer several times per year. I'm not sure about cold hardiness. Seems to tolerate some drought once established. Canarium commune-Family: Burseraceae. Common Name: Java almond. This has been moved to Canarium commone although the nuts seem to be larger. Large tree native to Pacific basin. Pinnate leaves are 3 ft. or more long. New growth is reddish. Fast growing once established. Seeds were originally from Indonesia and are smaller than material received as C. indicum. Nuts are about the size of a small pecan. Fleshy layer of pulp turns purple when ripe. Canarium indicum-Family: Burseraceae. Common Name: canarium nut, galip nut. This has been moved to Canarium commone although the nuts seem to be larger. Large tree native to Pacific basin. Pinnate leaves are 3 ft. or more long. New growth is reddish. Fast growing once established. I obtained seeds from Australia from trees that are supposed to be self pollinating. Nuts are about the size of a pecan. Fleshy layer of pulp turns purple when ripe. Canarium ovatum-Family: Burseraceae. Common Name: pili nut. Large tree native to the Pacific basin. Pinnate leaves are 3 ft. or more long. Fast growing once established. Nuts are about the size of a small pecan. Fleshy layer of edible pulp turns purple when ripe. Requires tropical growing conditions. Full sun. Well drained soil. Carissa edulis- Apocynaceae. Common name: unknown. Large shrub up to 9 ft. fragrant white flowers in the summer. Edible black fruit. Long thorns. Drought tolerant. USDA Zone 10. I've have blooms continually on my plants but no fruit production. Probably better in a drier climate. Carica pubescens- Caricaceae. Common Name: Chamburro. This species is more cold tolerant and is generally grown at higer altitudes. Can be used for jams, preserves and juices. Plants may be dioecious; male and female blooms on separate plants; a small percentage of plants may bear both male and female blooms. This species performed well outdoors in Northern California in a a southwestern exposure where it was protected from severe frost. However, at lower elevations in Hawaii, it did not grow well for me. Chrysophyllum auratum- Family: Sapotaceae. Medium tree native to tropical South America. Fruits are about 3 inches in diameter. Ripen to a greenish-yellow. Soft pulp has thick milky juice and a mild sweet flavor. I have 10 trees that have fruited and there doesn't seem to be much variation in quality or size. Trees prefer to be kept moist and will drop leaves in times of drought. Mulch and fertilize regularly for best growth. Couepia polyandra- Family: Chrysobalanaceae. Rare fruit with sweet soft flesh. Fruits have to be picked when fully ripe. Native to tropical rain forest of South America. Leaves have a white underside and glossy deep green upper surface. Large 4 inch seeds. Slightly acidic soils rich in organic matter. Full sun to light shade. Outdoors in Zone 10B to 11. Cynometra cauliflora- Family: Fabaceae. Common Name: Namnam. 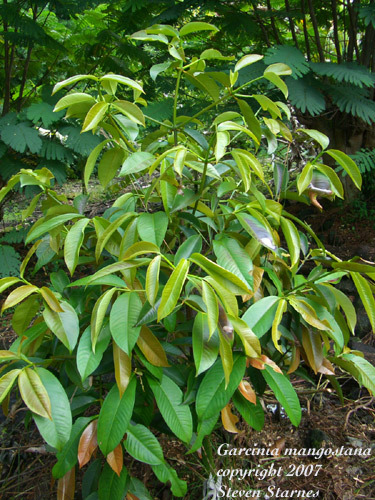 Medium slow growing tree native to Indonesia. 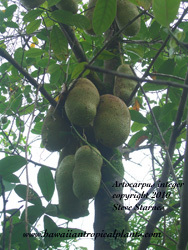 Pods contain an edible pulp; often eaten cooked. Young plants need light shade and slightly acidic soil. Young plants are very slow growing and have been difficult to establish. Dillenia indica-Dilliniaceae. Common name: elephant apple. Native Indian fruit on medium size tree. Fruits are used in drinks and chutney's and curries. Tropical requirements. 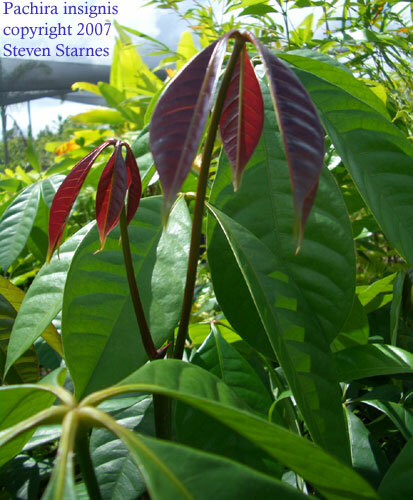 Attractive long leaves with serrated edge. Very large white flowers. Germination begins in 4-5 weeks and continues sporadically for 2 or 3 months. Growth rate is slow to moderate. 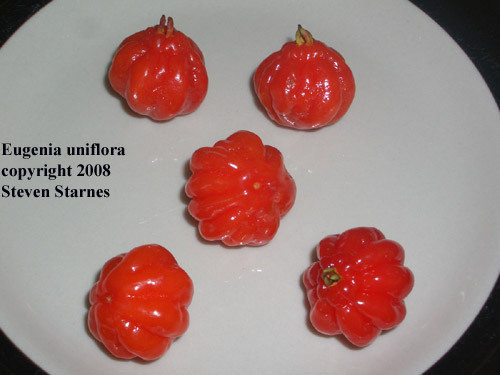 Dimocarpus longana- Family: Sapindaceae. Common Name: Longan, Dragon Eye. Medium tree native to South China and tropical South East Asia. Brownish fruits contain a sweet translucent flesh. Melon-like flavor. 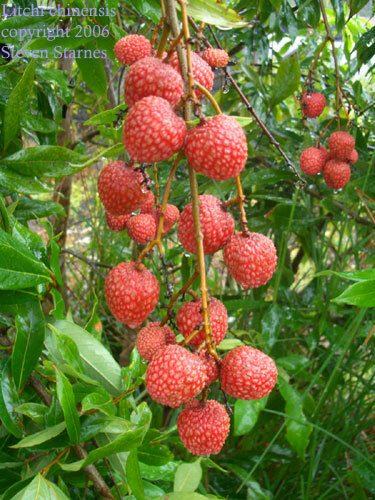 Withstands wind and drought a little better than some lychee cultivars. Dark green pinnate leaves. Growth tends to be a bit sprawling in some cultivars. Slightly acid soil. Fertilize with potassium in the winter to encourage blooms in the spring. May tolerate light frost but a hard freeze will cause damage. Fresh seeds are typically available in the fall and winter. Dioscorea sp. Family: Dioscoreacea. Vigorous perennial vine native to SE Asia. 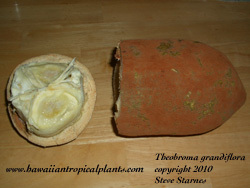 Large aerial tubers are edible when cooked. Growth rates are 6 to 8 inches per day in the summer. Tubers form in the late summer and fall. Plants go dormant in the winter vines die back to the ground in late November or early December; new growth begins in early spring. Tubers that have been stored dry begin to sprout in March or early April and can be planted. Probably reliably hardy in Zone 9 with mulch. Diospyros cauliflora- Family: Ebenaceae. 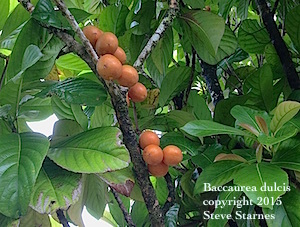 Tropical fruit tree related to persimmon. 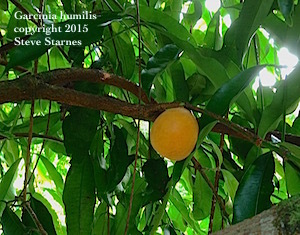 Bright orange round fruit are born on the main limbs. Young plants are somewhat slow growing. Unfortunately, my seedlings did not survive. Seems to be a bit delicate when small. Durio zibethinus- Family: Bombacaceae. 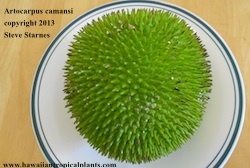 Common Name: Durian. The king of tropical fruits. Large trees native to Borneo and South East Asia. 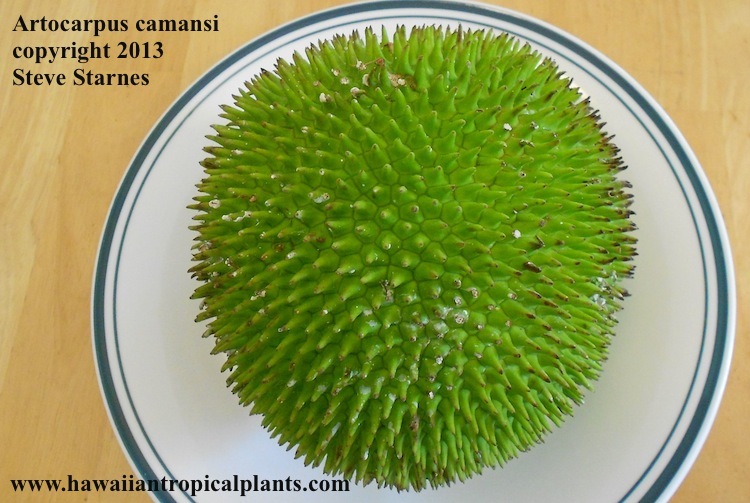 Large spiny fruits drop when ripe and have a strong odor. Size, shape and weight depend on the cultivar. Weights vary between 2 and 10 pounds typically; some large fruited cultivars weigh more. I've seen huge fruit that weigh almost 20 lbs. at the local farmers market. Cream colored flesh around large seeds. Flavor is rich, complex and similar to a fine soft cheese with hints of nutty or fruity flavors. Slightly acid or neutral soils. Strictly tropical and does not tolerate cool temperatures. Best in areas that rarely fall below 60F. Full sun. Prefers moist soil but will grow in lava rock and pumice as long as plants are mulched several times per year. Grafted plants fruit at about 7 to 9 years old. Seedlings can take 9 to 10 years to produce fruit. Fresh Seeds are available periodically throughout the year. Seeds may be germinating when you receive them. Handle carefully to avoid damage to the emerging root. Plant in individual pots; 1 gal. nursery pots are a good size to start the seeds. Eleagnus latifolia-Family: Eleagnaceae. Arching branches are covered with tiny jasmine scented flowers 4 or 5 times a year. Fruits are about 1/2 inch long and ripen to bright red. Sweet to slightly astringent taste. Can be used for jams, jellies, sauces or eaten fresh. Plants are very productive once established. Full sun. Rich soil. Outdoors in USDA Zones 10 & 11. Emblica officinalis- Euphorbiaceae. Common name: amla. Native to India. The fruits are very high in vitamin C. They are used as preserves and medicinally or are eaten stewed with sugar. Germination begins in 7-10 days. Growth is moderate to fast. Plants have small leaves lining the brances; this give the appearance of large pinnate leaves on young plants. Easy to grow. Eugenia brasiliensis-- Myrtaceae. Common Name: Brazilian cherry. 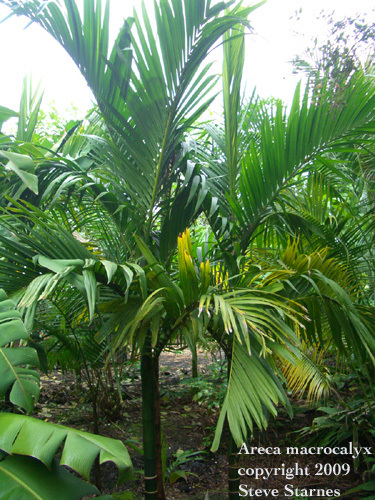 A tropical large shrub to medium tree. Begins to fruit at about 6 ft. tall. Deep green glossy leaves. Sweet cherry-like fruits ripen to almost black. Good container plant. Full sun. Slightly acidic soil high in organic matter. Fertilize lightly several times per year. Tolerates only light frost. Outdoors in Zones 10 to 11. Eugenia stipitata- Myrtaceae. A tropical species from South and Central America. Used for juice and preserves. Makes a good container plant. New foliage is red to bronze. Fruits are about the size of an orange with a thin skin which turns bright yellow when ripe. Plants begin to fruit when only 18 to 24 inches tall. Sets fruit when growing in a container and should make and interesting greenhouse crop. Here in Hawai'i, we get several crops each year. Tolerates a wide range of light conditions from medium shade to full sun. Our Does best in humid areas. It has proven to be more cold tolerant than I had expected. My seedlings have survived low temperatures of 35 degrees F when we were in California before I moved to Hawaii. Eugenia subterminalis- My source in South America says that this is really Plinia inflata. Small tree with sweet yellow fruit. Glossy deep green leaves. Native to tropical rainforest of Ecuador. Growth rates are moderate. Needs rich well drained soil. I don't expect this species to have much cold tolerance. Young plants thrive in light to mediums shade. Outdoors in Zones 10B to 11 or indoors in a container. Eugenia uniflora- Family: Myrtaceae. Common Names: Suriname cherry, Pitanga. Fruits are about the size of a cherry and range in color from yellow to black. I tend to prefer the black cultivars which have a sweeter rich flavor. Orange to red fruits tend to have a tangerine-like flavor. Some variation in seedlings but seedlings are coming out similar to parent plant unless several cultivars are planted close together. Large shrub to small tree. Full sun. Tolerates brief light freezes (26F to 27F) and can be grown outdoors in California and Florida. Eugenia victoriana- Myrtaceae. A South American species with 3 inch fruits similar in flavor to tart passion fruit (lilikoi). Tropical requirements. Seeds germinate in about 2 months. Culture is easy. Plants need light to medium shade when small. Should be a good container specimen. Plants need a steady supply of fertilizer or light mulch. Iron and magnesium are needed so be sure to use a fertilizer or supplement that has these elements. Slightly acidic soil. Garcinia cambogia- Syn. G. gummi-gutta. It appears that Garcinia gummi-gutta is the correct name for this species now. Small to medium tree native to tropical Asia.These are reported to be monoecious so only 1 tree is required to produce fruit. However, I've just started growing this species in early 2015 and it may be best with 2 or 3 for pollination. Grown for dried peel which is used as a flavoring agent. Also, used as a weight loss supplement; don't use highly concentrated extracts. Unusual ridged fruits with thin pulp. 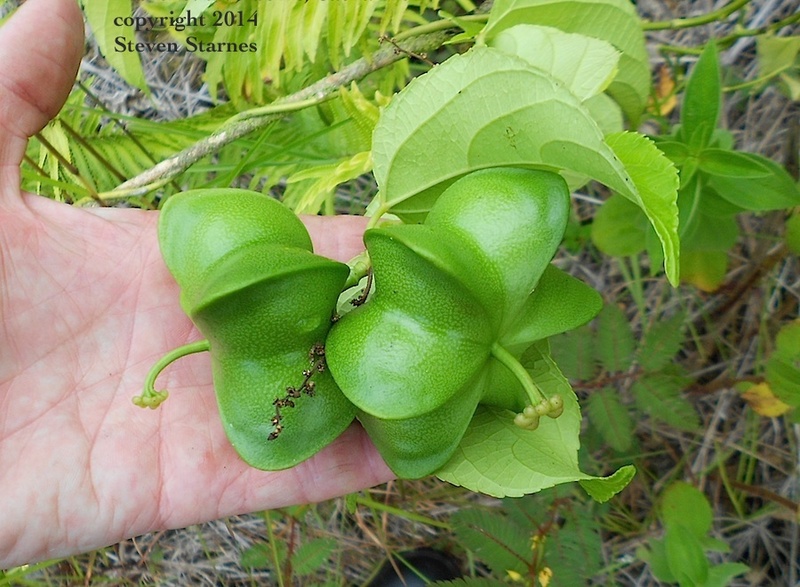 Garcinia forbesii- Small tree native to tropical Asia. Red fruits. Sour peel is dried and used in cooking. Young plants are very slow growing. Growth becomes faster after they are about 1.5 years old. Needs some shade or protection when small. Requires warm humid conditions for growth. Dioecious; ie. male and female blooms occur on separate plants. Outdoors in USDA Zone 11. Garcinia hombroniana-Family: Clusiaceae. Common name: Beach mangosteen. Small to medium tree native to tropical rain forest at low elevations. Reported to tolerate coastal conditions. Likely better to tolerate wind and adverse growing conditions than many related Garcinia species. Warm humid conditions are required. Full sun. Well drained slightly acid soil. Outdoors in USDA Zone 11. Garcinia humilis- Family Clusiaceae. Common Names: Achachairu, Bolivian mangosteen, achacha. Small tree bearing fruits about 2.5 to 3 inches long. Sweet white pulp is very good. The peel can be immersed in boiling water and sweetened to make a tea. Young trees are slow growing. Starts To bear fruit at 5 to 6 years old. Slightly acidic soil high in organic matter. Warm humid growing conditions. Outdoors in Zone 10B or higher. Garcinia macrophylla- Family Clusiaceae. Common Name: Bacurpari. Small tree native to Brazil. Fruits ripen to yellow. Deep green glossy leaves are about a foot long. Young plants need shade and protection from low temperatures. Mature plants are reported to tolerate brief periods near freezing. Growth is best where temperatures rarely fall below 50F. Garcinia magnifolia- Clusiaceae. Common name: madrono. Formerly classified as Rheedia magnifolia. Botanist have merged the genus Rheedia into Garcinia. Relative of the Mangosteen native to tropical South America. Medium size tree. Large glossy leathery leaves. My experience with other Garcinia species indicates that they may be challenging outside of the tropics. Slow growing. Needs about 50% shade and protection from wind when young. Mature trees may tolerate full sun. Well drained soil high in organic matter. Fruit is reported to be delicious fruit. Best if minimum night temperatures are kept above 55F. Garcinia mangostana- Family: Clusiaceae. Common name: mangosteen. Queen of the tropical fruits. Succulent white pulp with an excellent flavor. I would compare it to a combination of peach and lychee flavor. Fruites ripen to dark purple and have a thick rind. Trees grow very slowly and may require 12 to 15 years to bear fruit. Recent genetic studies have revealed that it is very closely related to G. malaccensis; prior work theorized that it was a hybrid between G. hombroniana and G. malaccensis. Young plants need shade. Water during droughts will speed growth. Fertilize several times per year with an organic fertilizer. Slightly acid soil that is high in organic matter. Mulch lightly several times per year. Zone 11. Garcinia prainiana- Clusiaceae. Common name: cherapu or button mangosteen. Relative of mangosteen native to tropical Asia. Young plants are very slow growing. Small tree with dark green thick glossy leaves. Very ornamental. Bright orange fruits are reported to be good quality. Needs shade when young and protection from wind. Best in humid lowland tropical areas or warm greenhouse. Rich soil high in organic matter. 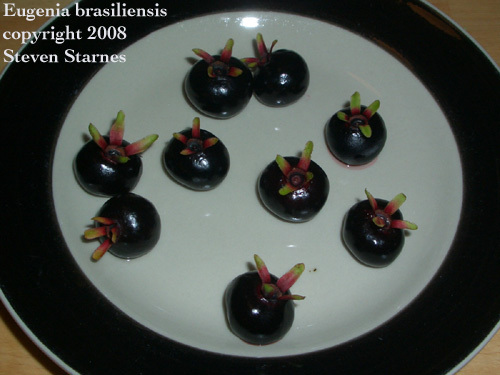 Fruits at a younger age and smaller size than mangosteen; 1st blooming occurs when about 6 to 7 years old. Under ideal conditions it could bear in 4 or 5 years but I think that 6 years is more realistic. Garcinia sp.- Clusiaceae. Common name: madrono del monte. Relative of mangosteen native to tropical South America. Yellow 3 inch fruits are reported to be good quality. Young plants are a bit slow growing but speeds up in the 2nd or 3rd year. Small to medium tree with dark green thick glossy leaves. Very ornamental. Needs shade when young and protection from wind. Best in humid lowland tropical areas or warm greenhouse. Rich soil high in organic matter. Inga edulis-.Fabaceae. Common name: ice cream bean. Long cylindrical pods (up to 2 ft.) filled with a juicy sweet pulp. Medium to large tree with large pinnate leaves. White blooms similar to Albizia (mimosa). Fast growing. Seeds germinate quickly and may sprout in transit; shipped in moist peatmoss or coir. Our trees have a few pods which should ripen in a couple of months. Inga jinicuil- Family: Fabaceae. Large pods are filled with white sweet pulp. Trees form a wide spreading low crown. Native to tropical forest of South America. Full sun. Well drained soil. Outdoors in Zones 10B and above. Inga laurina-- Family: Fabaceae. Common name: Ice cream bean. Smooth light green pods. Medium sized tree. Native to tropical rain forest of South America. Inga spectabilis-- Family: Fabaceae. Common name: Ice cream bean. Pods are filled with sweet white pulp. One of the most attractive Inga species with new growth that emerges deep red. Outdoors in Zone 10B or higher. Inga species-- Family: Fabaceae. Common name: Ice cream bean. This tropical legume produces pods filled with white sweet pulp. 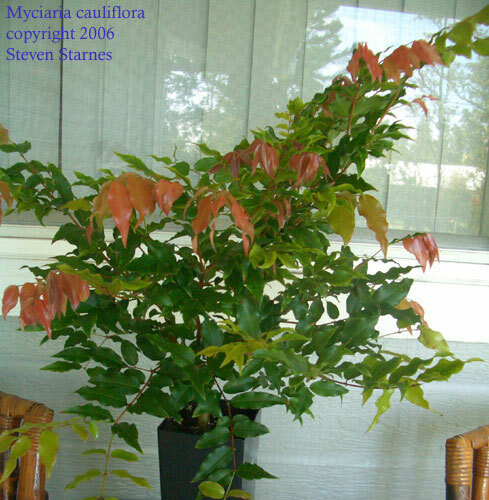 Forms a medium to large tree with attractive pinnate leaves. Try pruning to keep small. It has dark green glossy leaves. It withstands hot dry winds better than Inga edulis. Pods are about 10 inches long with pulp that has a sweet floral taste. Seeds germinate in 2 to 7 days. Lablab purpureus- Fabaceae. Syn. Dolichos lablab. Common names: hyacinth bean, lablab. Perrenial vine up to 30 ft.. Purple flowers. Leaves and seed pods are purple. Fast growing in hot weather. Sometimes planted as a cover crop. Young tender pods may be eaten. Lichi chinensis- Family: Sapindaceae. Common Name: lychee. Medium to large tree native to southern China. Deep green pinnate glossy leaves. Fruits ripen to red. Succulent juicy white sweet flesh. One of the best tropical fruits. Numerous cultivars have been selected in Asia. Slightly acid soil. Best in humid regions. Tolerates light frost. A hard freeze will cause damage. Some culivars set fruit best when temperatures drop into the 40s during the winter. 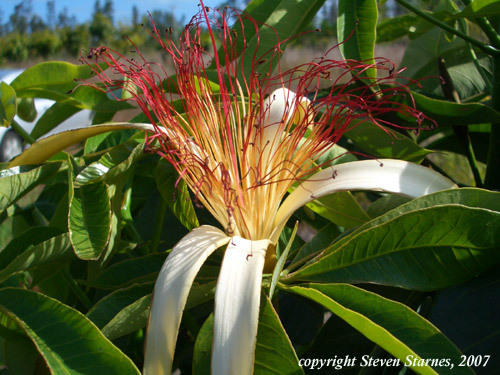 In Hawai'i, we fertilize with potassium in late December or early January to encourage blooming in the early spring. Lansium domesticum- Family: Meliaceae. Common Name: langsat, lanzones. Medium to large tree native to tropical rainforest of southeast Asia. Fruits ripen to pale tan. Translucent sweet flesh with a hint of citrus. Plants are slow growing and may take more than 10 years to fruit. Young plants may prefer a little shade. Larger plants can take full sun. Best with some protection from wind. Rich soil. Keep moist. Plants can tolerate some drought once established but prefer a steady supply of moisture. Outdoors in Zones 10B and 11. Due to irregular availability of seed, there may be waiting list for this species. Lepisanthes amoena- Family: Sapindaceae. Small tree native to Malaysia and Indonesia. Fruits are edible. Nice pinnate leaves Young plants are slow growing. New growth is red. Light shade when young. Prefers warm moist growing conditions. Reported to be dioecious. Begins to bloom at about 6 ft. tall and 4 or 5 years old. Litsea garciae- Family: Lauraceae. Common Name: engkala. Medium sized tree native to Indonesia. Fruits resemble a small avocado. Have a rich flesh. Simple leaves about 8 inches long. Young plants are slow growing, but once established growth becomes fast. Full sun. Rich soil high in organic matter. Best with some protection from wind. Madhuca indica- Sapotaceae. Common Name: Butter tree, mowra. Tree native to india. Fruit is edible and the seed yields an oil used in cooking. Flowers are reported to contain very sweet nectar and are used as a sweetener. Growth is slow to moderate. Cold tolerance unknown. Seems to go dormant in the winter here; very little growth from December to March. Fastest growth is in the summer when days are around 85F. Mangifera odorata- Anacardiaceae. Common name: kuini. Native to rain forest of tropical Asia. This mango relative has high quality fruit which ripens to a yellowish-green. Ripe fruits have a strong scent and you can readily tell when they are ripe. Completely ripe fruits fall from the tree. Flavor is similar to the common mango and the fruits are sweet and very juicy. During fruiting season check under the tree every day. Under ideal conditions trees may bear twice a year. Tree is only slightly smaller than mango tree. Tends to have a narrower canopy and is suitable for small yards. New growth is dark maroon and turns blood red before turning deep green. Looks like this one will be very ornamental as well as edible;. It is also resistant to Anthracnose and is suitable for high rainfall areas. Manilkara hexandra- Common name: Khirni. Sapotaceae. Relative of sapodilla. Oval glossy leathery leaves. Fruits are edible fresh or dried. Native to India and Southern Asia. Best growth is during hot sunny weather. Not commonly grown in the US. Mesua ferrea- Common names: Nag champa, Indian rose chestnut, ironwood. Clusiaceae. Native to tropical forest of India. Medium sized tree with 2 to 3 inch white fragrant flowers. New growth is blood red. Mature leaves are dark green and leathery. Very ornamental. Seeds might be edible if well cooked. Also has medicinal uses. Germination is rapid. Growth is slow. Can easily be maintained in container for a number of years. Begins to bloom at about 5 ft tall and 6 or 7 years old. Mimusops elengi- Sapotaceae. Common name: .Yellow fruit to 1 inch. Small to medium tree to 30 feet. Native to Southeast Asia. Small fragrant flowers. Dark glossy green leaves. Mimusops zeyheri- Sapotaceae. Common name: unknown. Smaller than the above species. Our plants are tending to be shruby. Leaves are deep glossy green. Native to Southern Africa. 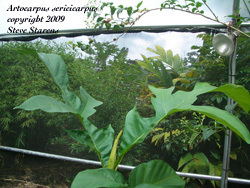 Morinda citrifolia- Rubiaceae. Common Name: noni. Bush with large glossy leaves. Fruit is used medicinally. Fruit changes from green to yellow or white when ripe. However, ripe fruit is foul smelling; resembles rancid cheese. There are many claims for the health benefits of the fruit. Research is in progress at some universities to confirm some of the reported claims. Fruit ripens year round in Hawai'i. Fruit production is heavier during hot sunny periods. Grows best at lower elevations. Drought tolerant. Grows well even in poor rocky soils with little fertilizer. Moringa oleifera- Common name: Horseradish tree. Young seed pods are eaten like green beans. Young leaves are used as greens. Roots are used as horse radish substitute. Small tropical tree native to SE Asia. Tripinnate leaves. Young plants need warm conditions. Moderate to fast growth rate. Young plants are slender and become a bit lanky. Prune to encourage multiple stems to form. Full sun. Fertilize several times per year. Flowers are slightly fragrant. Murraya koenigii- Rutaceae. Common name: Curry leaf. Small tree with pinnate leaves. Leaves have a citrus-grape scent and are an essential ingredient in many South Indian curries. Tropical requirements. Rich well drained soil and frequent applications of fertilizer in the summer. Full sun. Myciaria cauliflora-Myrtaceae. Common name; jaboticaba. Small to medium tree. Young plants look like a natural bonsai. Very ornamental and an excellent container plant. Hardy to 24F or 25F. Dark purple fruit 1 to 2 inches in diameter is born on the trunk and main branches. White soft very juicy pulp is similar to muscadine in flavor but superior. This is one of my favorite trees both for ornamental characteristics and fruit. Slow growing. May take 8 to 10 years to fruit from seed. Myciaria glazioviana-Myrtaceae. Common name: yellow jaboticaba. Large shrub to small tree producing fuzzy yellow fruits about an inch in diameter. Native to Brazil. Dark green glossy leaves 3 to 4 inches long. Full sun to light shade. Slightly acidic soil high in organic matter. Best in warm tropical climates with high humidity. Can be grown in a large pot. Fruits at 4 to 5 years old when only 3 to 4 ft. tall. Outdoors in Zone 10B or in a greenhouse or sunroom. 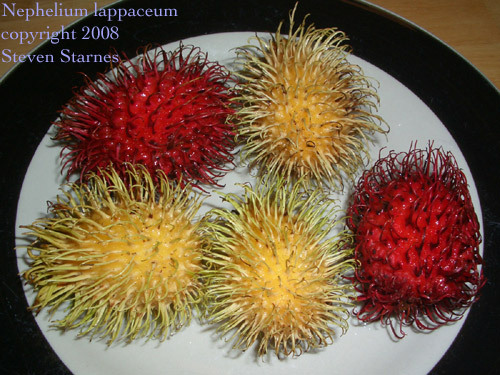 Nephelium lappaceum- Common name: Rambutan. Sapindaceae. Tropical fruit related to the lychee and longan. Sometimes called hairy lychee. The rind has soft projections from the surface. White translucent pulp has a sweet delicious flavor. Needs full sun and tropical conditons. Best in an area with rich soil and protection from wind. Nephelium rambutan-ake -Common name: Pulasan. Sapindaceae. Tropical fruit related to the lychee and longan. The rind has soft blunt projections from the surface. White translucent pulp has a sweet delicious flavor. I prefer pulasan to rambutan. Needs full sun and tropical conditons. Best in an area with rich moist soil and protection from wind. Oroxylum indicum- Bignoniaceae. Common Name: Indian trumpet tree. Native to eastern India. Trumpet shaped flowers. Dark green pinnnate leaves. The pods are eaten and maybe the young leaves. This is a new species for us but looks promising for edible landscaping. Flat seeds are about the size of a quarter Seeds germinate in 1 to 2 weeks. Seedling growth is moderate to rapid. Pachira aquatica- Family: Bombacaceae. Large tree native to Central and South America. Large blooms are fragrant at night. Large brownish pods up to foot long are filled with large seeds which are eaten roasted. Begins to bloom at about 6 ft. tall. I don't expect trees this size to set any pods until it is much larger. Palmate leaves emerge green. The trunks this species lacks the bulbous base that develops on P. glabra at a young age. However, trunks develope buttresses with age. Also, blooms tend to last longer during the day than P. glabra. Much of the material in cultivation as P. aquatica is actually P. glabra although the 2 species are easily distiguished when more than about 3 ft. tall. Pachira glabra- Family: Bombacaceae. Common Names: Saba nut, money tree. 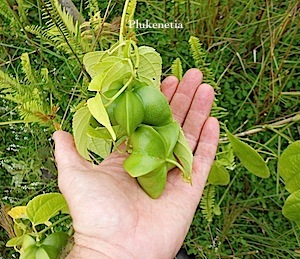 6 inch green pods filled with edible seeds about the size of a filbert. Pods split when ripe and the seeds fall out. Large white flowers are fragrant at night; flowers drop by the middle of the next day. Small to medium tree. Trunks develop a distinctive bulbous base at an early age. Often braided or sold as a bonsai. 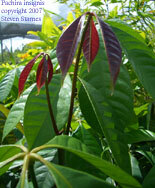 This is often seen labeled as Pachira aquatica in the nursery trade. The 2 plants are easily distinguished. Plants that are grown outdoors a sparsely branched. For dense branching cut just above the bulge in the lower trunk. Seeds germinate immediately and will be shipped when fresh. Handle with care to avoid damage to the emerging root. Pachira insignis- Family: Bombacaceae. Large pods filled with edible nuts. Large red flowers. Large palmate leaves are a foot or more in diameter. New growth is deep red color. These 2 characteristics easily distiguish this species from P. aquatica and P. glabra. P. insignis lacks the swollen trunk base. Pappea capensis- Common name: dopruin. Sapindaceae. Native to South Africa. Small or medium tree. Glossy serrate leaves. I think this tree will be an interesting ornamentmental. Quality of the fruit is not known at this time. Can tolerate moderate frost and drought. Seedlings are rather slow growing. I'm not longer growing this species. Just too slow in our rain forest environment. It seems to prefer a hotter drier climate. Passiflora edulis var. flavicarpa- Passifloraceae. Common names: Lilikoi, yellow passion fruit. Similar to other P. edulis. selections Vigorous vine with large yellow sweet tart fruit. Excellent for juice and jelly. Full sun. Well drained soil with some organic matter. Keep moist. Seedlings may be somewhat variable. Can be grown from cuttings taken in the spring. Vines are productive even growing in lava and pumice. Passiflora laurifolia- Passifloraceae. Common name: water lemon. Native to West Indies and South America. Large vine with glossy leaves. Very nice flowers are followed by fruit that ripens to yellow. Sweet perfumy taste. Personally I prefer the flavor of other Passiflora species. Full sun. Well drained soil with some organic matter. Keep moist. Established plants have good drought tolerance if humidity is relatively high. Passiflora ligularis- Passifloraceae. Commnon Name: sweet granidilla. Vigorous vine with light to medium green heart shaped leaves. 3 to 4 inch blooms. Large high quality fruit with thin shell; white sweet pulp. . Performs well in Coastal California in areas that don't freeze. Also does well in a cool greenhouse. In Hawai'i it grows best at higher elevations. At lower elevations, it is best with some afternoon shade. Passiflora quadrangularis- Passifloraceae. Common name: Giant Passionfruit. Large leaves and 4 angled stems. Flowers are large 4-5 inches with deep red petals. Vine requires full sun or light shade and warm conditions to grow rapidly. Can become a massive plant. Very large fruits are sweet and very good. Ripe fruits develope a hint of gold and the rind becomes soft. They do not fall from the vine when ripe.If you are growing in a container, you may have to prune the vine twice each year. Flowers and fruit are on new growth so pruning does not interfere with flowering. Seeds should be planted within a few weeks after removing from fruit. Soak 8 to 12 hours in black tea. Barely cover with sterile potting mix. Germination is best at temperatures above 80F. Seeds will be shipped only when I have fresh fruit. Pentagonia grandiflora- Rubiaceae. Common name: unknown. Small tree with 2 inch white flowers. Edible fruits to 3 inches. Large leaves to 2 ft.; clustered near end of the branches. Full sun to medium shade. Warm moist conditions are best. Shelter from wind. Rare in cultivation. Piper nigrum-Piperaceae. Common name: black pepper. Commercial source of black pepper. Tropical vine with cordate leaves. Forms roots at each node. Likes rich well drained soil. Full sun to medium shade. Propagated by seed, cuttings or airlayers. I get the best results with airlayering; 100% success in rooting. Plukenetia volubilis- Euphorbiaceae. Common Names: Sacha inchi, ticazo, Inca peanut. Nuts are high in omega 3 and 6 fatty acids. Vines need some support and can be grown in full sun or light shade. They are quick to bear and begin to bloom at about 6 to 7 months old. Blooms occur on new growth and male & female flowers are found on the same inflorescence. They respond well to seaweed extract and organic fertilizers. This vine is native to tropical rain forest in western South America. I do not expect it to have much tolerance to cold. In subtropical climates it will likely require winter protection; cut back the vines and bring into a greenhouse for the winter. Pouteria campechiana-Family: Sapotaceae. Common Name: canistel, egg fruit. The pulp is bright orange and has the consistency of a hard boiled egg yolk. Sweet with a rich flavor. Fruits must be very soft and fully ripe to have the best flavor. Trees fruit when 6 or 7 ft. tall. Full sun. Tolerates low temperatures of 32 or 33 F. Native to Central America. Pouteria sp. 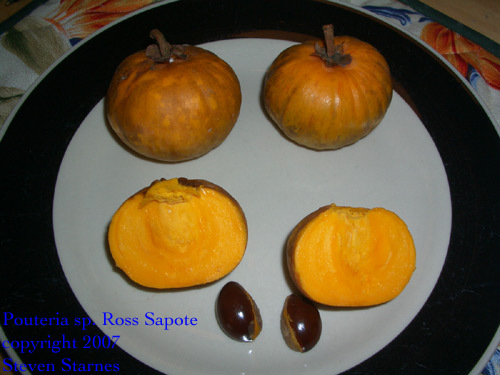 "Ross Sapote"-Family: Sapotaceae. Common Name: Ross Sapote. 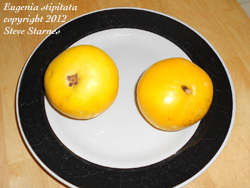 Similar to canistel but a little sweeter with a fruitier taste. Fruits ripen to bright yellow and must be soft to be at their best flavor. Pouteria multiflora- Family: Sapotaceae. Common Name: unknown. Huge seed about 2.5 inches in diameter. The young plant struggled and grew very slowly for about 8 or 9 months. However, once established growth is rapid; 2 to 3 ft. or more per year. Fruits are reported to be large. Native to the Amazon basin. 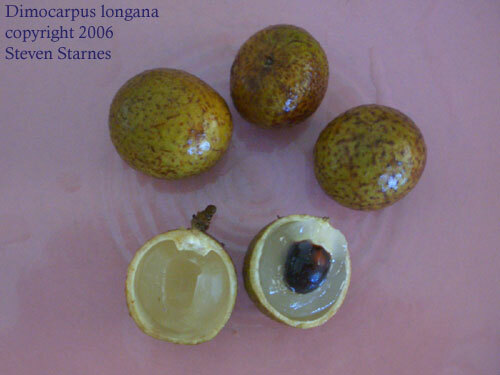 Pouteria sapota- Family: Sapotaceae. 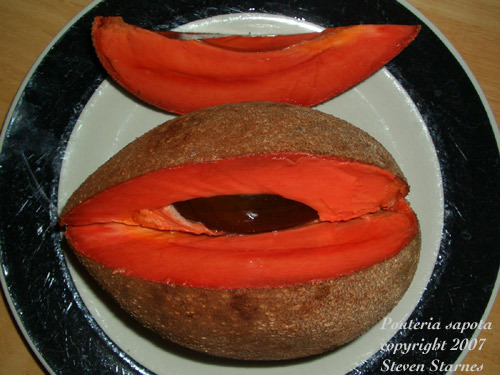 Common Name: Mamey sapote. Large fruit reach about 2 lbs. or more. Brown rough peel conceals deep orange-red flesh. Similar in flavor to a baked sweet potato. Large trees reach 60 to 75 ft. in height. Native to Central America and Carribean. Full sun. Best in warm conditions at sea level to 1000 ft. High elevations may be too cool to get good crops of fruit. The trees survive drought quite well. Fruits can take 18 months to 2 years to ripen. Pouteria viride Family: Sapotaceae. Common Name: Green Sapote. Although the peel is green with just a hint of orange, the interior is a nice orange color similar to a sweet potato. Finally found fruit at a local farmers market. 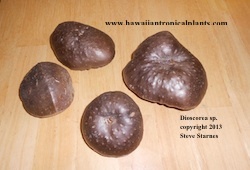 Flavor is similar to mamey sapote but they are much smaller. Growth is slow for the 1st year. During the 2nd year growth is much faster. Psidium angulatum- guayaba agria. South American guava species. Attractive deepgreen leaves. Easy culture. Growth is moderate. Takes 4 or 5 years from seed to produce fruit. Fruits are about 3 inches in diameter and turn yellow when ripe. Fragrant fruit with very nice sweet tart flavor. Seeds are about the size of a small pea and are easily removed from the fruit. 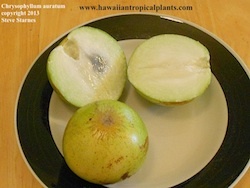 Most guavas grow well in containers and can be pruned to maintain small size. germination takes 2-4 months. Psidium guineense- Myrtaceae. Common name: guisaro. Another guava species. Fruits have a rich sweet strawberry flavor with small hard seeds. Reported to make an excellent jam. 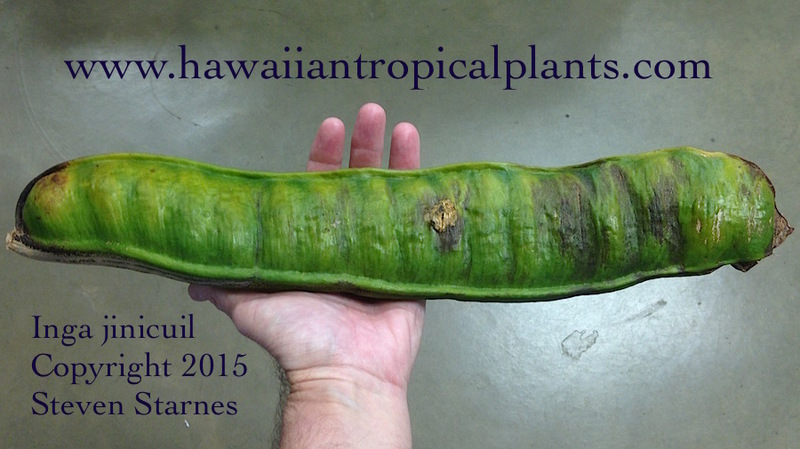 Another tropical with great indoor or greenhouse potential. Very easy to grow. Plants begin to fruit when about 18 inches tall. Can be cut back to maintain small size in a container. Full sun. Keep moist. Well drained soil. Tolerates light frost. Seeds germinate in about 1 month at 80F. Fresh seeds are available in the summer. Psidium littorale- Myrtaceae. Common name: Yellow strawberry guava, red strawberry guava. Large shrub to small tree. Sweet fruit with the flavor of strawberry, pineapple and guava. In my opinion, the yellow fruited form has the best flavor. Used for jams and jelly. Prolific quantities of fruit are produced in the fall or winter. In Hawaii, this plant is invasive. In deep rich soil, plants can reach 30 to 35 ft. but are typically much smaller. They will grow and fruit even in poor soil. Often found growing in a cracks in lava with minimal amount of soil. Excellent container plant. Hardy outdoors in areas where temperatures rarely fall below 25F. Psophocarpus tetragonolobus- Fabaceae Common names: winged bean, goa bean. Large vine with tuberous root. The young pods are edible like green beans. Mature seeds are edible. The root is cooked like potato and eaten; high in protein. Pretty light blue 1 inch flowers are ornamental. Requires a long growing season. Grow like ordinary pole beans. Can be started in containers and transplanted to the garden. These are day length sensitive and may be difficult to get to bloom in the longer summer days outside of the tropics. I have heard that there is a selection that will bloom during long days in temperate climate summers. Quararibea cordata-Family: Bombacaceae. Common Name: chupa-chupa. Large rainforest tree native to South America. Fruits are 5 to 6 inches in diameter with a thick rind. Bright orange pulp is soft and sweet with a muskmelon-like flavor. This species requires tropical conditions and is sensitive to cool temperatures. I was not successful growing this species in a greenhouse in Northern California. Rauwenhoffia leichardtii-Annonaceae. Common name: Australian ylang. Small shrub maybe semi vine. has very fragrant flowers and reportedly edible fruit. My seedlings were started in California and were tolerant of the low humidity in the summer and the wet and cool winter; they were kept in a greenhouse that was heated just enough to prevent freezing. Slow grower the first 2 years. Although flower buds have formed, they never open and even dry up and fall off. Rauwolfia serpentina- Apocynaceae. Common Names: serpentine root, sarpagandha. Shrub used medicinally in India. Used to treat snake-bite and insanity. Glossy lanceolate leaves and clusters of small pale pinkish flowers. Rare in the US. It blooms when quite small and grows well in containers. Rhoicissus digitata-Vitaceae. Common name: Baboon grape. Reported to be edible. Very glossy ornamental leaves. Thick tuberous root develops at an early age. Well drained soil. Full sun. Tolerates freezing down to at least 25 degrees F without damage; probably can tolerate considerable colder. Drought tolerant. Moderate growth rate. 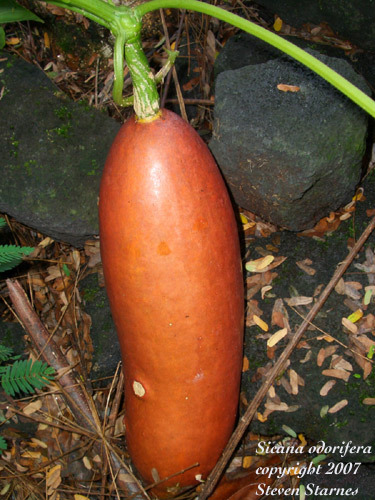 Rollinia deliciosa- Annonaceae. Common name: Biriba. Tropical relative of cherimoya. Small tree produces sweet aromatic fruit with soft white pulp. 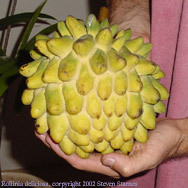 Begins fruiting when 5 to 6.5 feet tall and 2.5 to 3 years old. Fruits weigh 1 to 2 pounds. Rapid growth when warm. Our plants fruit periodically throughout the year. Tropical warm conditions are required. Protection from wind is best. Outdoors in Zones 11 and higher. Plants do not like long periods below 55F. Seeds are available periodically throughout the year; they are shipped removed from the fruit dried and shipped immediately. Seeds germinate in 15-40 days. Schleichera oleosa- Sapindaceae. Common names: Malay lac tree. Large tree to about 60 ft. native to India. Pinnate leaves. Edible young leaves and shoots. Edible fruit. Probably not frost hardy. New growth is a very nice shade of red. Young plants grow slowly. 5 years after planting the height is 4 to 5 ft. Drought tolerant once established. Doesn't seemed to be damaged by winds when planted in an exposed area. Takes about 6 to 8 years or longer to begin blooming. 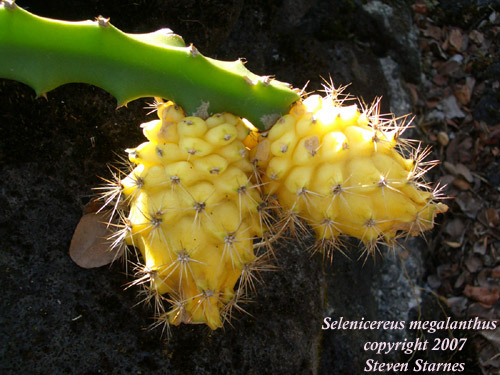 Selenicereus megalanthus- Family: Cactaceae. Common Name: Pitaya amarillo (yellow pitaya). Vining or sprawling cactus native to tropical South America. Bright yellow fruits are about 4 inches long. Very sweet pulp is white with numerous small black seeds. Large white flowers open at night. Grows well in rocky or poor soil. Full Sun. Sicana odorifera- Family: Curcurbitaceae. Long vines with attract glossy green leaves. 2 inch bright yellow male flowers. Female flowers are a little smaller with a young fruit attached to the base; it develops if pollinated. Hard shelled fruits ripen to orange, red or black. Fruits are scented and have a melon-like flavor. Strychnos spinosa- Loganiaceae. Common names: Kaffir orange, spiny monkey orange. Strychnaceae. Shrub to small tree. Native to South Africa. Drought tolerant once established. Fruits are edible and reported to be quite good; seeds should not be eaten. Zone 10 outdoors or grow in container. Requires good drainage. Full sun. Although plants tolerate cool temperatures around 40F, we are not sure if they will survive a freeze. This species bloomed for me several times but never set fruit. Syzygium cumini- Myrtaceae. Common name: Jambolan. Medium tree native to SE Asia. Fruit is used for jams and wine; sometimes eaten fresh. Glossy lanceolate leaves. Attractive tree which may be used for timber. Grown up to 6,000 ft. elevation in the tropics. Trees grown at high elevations may not fruit as well. Theobroma angustifolia- Family: Sterculiaceae. This species was difficult to establish. Young plants are suseptible to disease and often die within a month or 2 after comming up. Requires warm humid shady conditions. Must be protected from wind. Pulp is edible and seeds are edible roasted. I have one plant well established. Blooms several times per year but does not seem to set any fruit. Theobroma bicolor- Sterculiaceae. Common name: Nicaraguan chocolate. Seeds are delicious roasted. The flavor is complex with hints of cafe mocha and peanut. 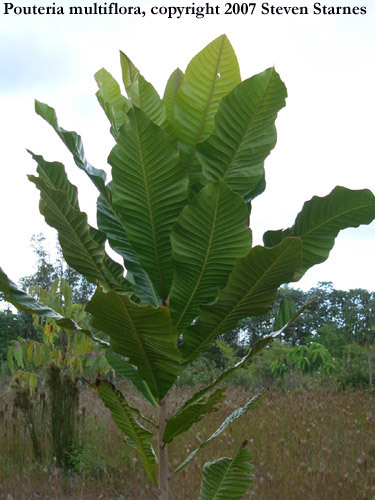 Plants have large cordate leaves. Moderate to fast growing. I had a difficult time establishing this plant. Only 15 out of 100 seedlings survived. However, the survivors were vigorous and strong. Unfortunately I put the plants in a sunny windy spot and they often suffer during dry windy periods. Best in a protected area with afternoon shade. Mulch and fertilize with composted chicken manure or another organic fertilizer. Theobroma cacao- Sterculiaceae. Common name: cacao, chocolate. Processed and roasted seeds are the source of chocolate. Small tree native to South America but widely grown in tropical regions. Pods are born on the trunk and main branches. Pods ripen to bright yellow or red. Best in light to medium shade in an area protected from wind. Grows easily here in Hawai'i. In temperate areas they will need a warm greenhouse or sunroom. Begins to bear at 3 or 4 years old. Seeds germinate quickly and must be kept moist at all times. Temperatures above 80F are best for germination. Seeds are available when I have ripe pods. Germination begins within a few days. Shipped in moist peat moss; handle carefully to avoid damage to emerging root. 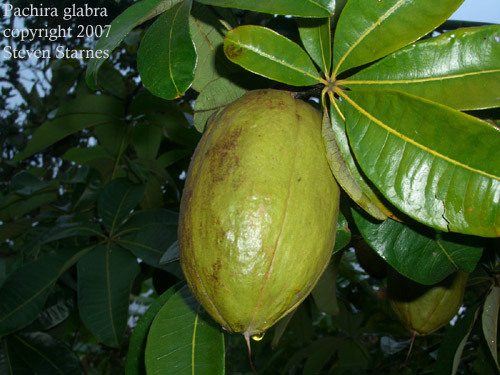 Theobroma grandiflora- Sterculiaceae. Common name: cupuassu. Native to Brazil. Bears brown pods filled with sweet pulp used in sherberts and ice cream. Seeds can be roasted and eaten. Fuzzy new growth is an intense purple-red. Best grown in an area sheltered from wind. Benefits from light applications of mulch several times per year. Exposure to windy conditions and cool temperatures will result in few blooms and no fruit. USDA Zone 10B or 11. Treculia africana- Moraceae. Medium sized tree native to tropical Africa. Large fruits contain numerous seeds about the size of large wheat or rice grain. Seeds are processed to make flour. Can be roasted to yield a coffee like beverage. Growth becomes fast once plants reach about 10 inches tall. New growth is red. Leaves are 6 to 10 inches long. Some drought tolerance once established. Xanthocercis zambesiaca- Fabaceae. Native to Southern Africa. Dark green glossy pinnate leaves. Medium tree. Pods are reported to contain edible pulp. I tried growing this species for several years. It seems to be very suseptible to a small boring beetle; extensive damage to the young trunk occurs. I'm no longer propagating this species. Responses may take 1 or 2 days. If you don't receive a reply within 2 days please email again or call between 4pm & 8pm Hawaii Standard Time. Steve: Cell Phone: 808-333-0505 (remember the time difference between the mainland and Hawai'i when calling). Email is the best way to contact me.